Kent Ultra is an easy to afford online UV water purifier. It has an elegant wall mountable design, fit for any kitchen. It saves expensive counter space and provides convenience while drawing water. 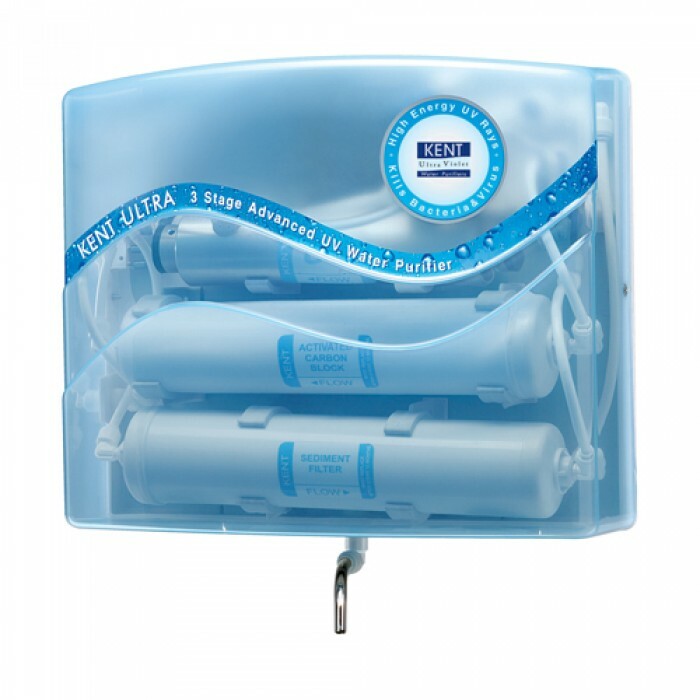 Kent Ultra is tested and certified for its performance and quality by renowned laboratories of the world such as WQA, the most recognized certification in the drinking water treatment industry and provides assurance that the products have been rigorously tested and comply with all the requirements of the testing standards. Kent Ultra is also CE certified. ​Computer controlled operation has a unique feature: UV Fail Alarm, that alerts the user when the UV lamp becomes inefficient and the power supply to the purifier is cut off, thereby ensuring that impure water is not being delivered to the user. Kent Ultra uses high powered 11W UV lamp instead of the industry standard 8W UV lamp, to provide complete de-activation of harmful microorganisms such as bacteria and viruses that can contaminate clean water. Purification Capacity 60 L/hr. or 1 L/min.